When tourists flock to the Manukau Heads, they will often stop for a photo op’. As a result, work by one local artist will likely be been seen in albums around the world. JON RAWLINSON spoke with Brenda Vester, a rural woman who takes a No.8 wire approach to creativity. The phrase ‘blink and you’ll miss it’ does not apply to Brenda Vester’s home on Grahams Beach Road. Blissfully unaware of how far I’d travelled during a spring day on the picturesque Awhitu Peninsula, I see the skeletal shell of a boat high above sea level and simply have to stop. I soon realise, while rattling off shots on my point-and-squirt camera, that I’m in the right place all along. Brenda greets me warmly at her front gate. “We have a lot of spectators stopping to take a look, so we’re used to it by now. We get great comments about the sculptures,” she says. While, initially, I’d stopped to take a closer look at the boat, it is sculptures that I’m really here to see. Fashioned from wire, they began life when inspiration shone… from a lighthouse. 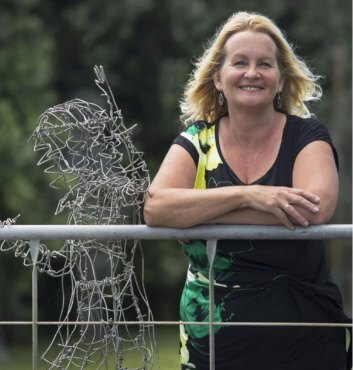 “Late last year, the [Manukau Heads] Lighthouse trustees were looking for sculptures by locals. I really wanted to enter something but, at that time, I hadn’t even begun making any. A couple of weeks later, I was given a load of wire and that’s when it all started,” Brenda explains. Figuratively speaking, a project intended to be a pot plant holder took on a life of its own, becoming (quite literally) a figure. “The first sculpture almost started designing itself! I began seeing that the bowl was taking on the shape of a human head. Known as the Forgotten Sailor, Brenda’s first sculpture stands as a poignant reminder to visitors that behind an area of extraordinary beauty lies a tempestuous and tragic history. Her next piece (which is also at the Lighthouse) saw Brenda draw on her youngest daughter, Katie, as muse and model. In total, this passionate sculptress has fashioned approximately 16 wire works to date, mostly life-sized representations of celebrities and specific people, whom she knows personally. Included in her collection are: Princess Dianna; tennis star, Novak Ðjokovic; herself and her children. Among them is a figure of her younger son, who tragically passed away in 1999. She says the process of making this sculpture was particularly therapeutic. One of Brenda’s most treasured pieces, of Jesus Christ, was on display at the Holy Trinity Anglican Church in Waiuku last Easter weekend. She says it may resume pride of place at the church come Christmas, and she might explore the possibility of entering works into next year’s Franklin Arts Festival. Brenda is not the only artist in the family. Ollie, her husband, constructs a wide range of woodcrafts ranging from furniture and gifts to funeral urns. A ship’s wheel he produced is also on display at the Lighthouse. Pieces by this creative couple are available for sale and both will work on commission.